Want to learn all there is to know about this event? 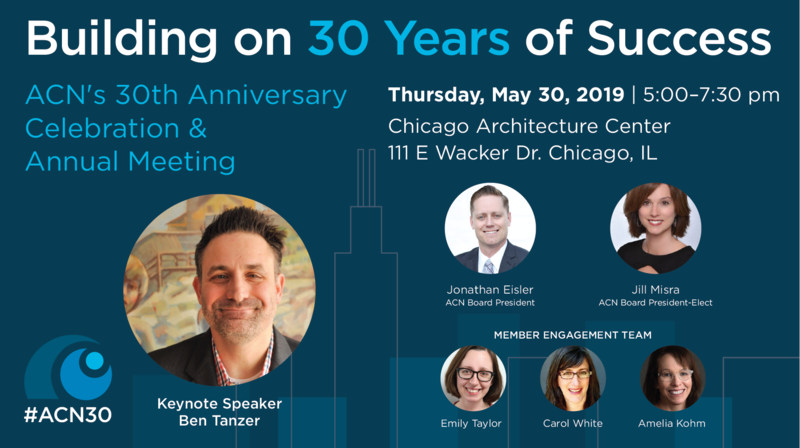 Visit our 30th Anniversary Event Page! Prices on May 1st increase - so register today. Would you like to consider sponsoring this event? Visit this page for more information about how you can get more involved with ACN. 02/21/2019 ACN's February Program: Dealing with Challenging Clients: How do you do it? Strategies and Skill Share for ACN Members and Guests! 11/15/2018 ACN's November Program: Design Thinking for Consultants & Nonprofits | Experience how this user-centered process helps organizations improve their impact. 09/20/2018 ACN's September Program: The Tax Cuts and Jobs Act… What do you mean every NFP organization will be affected? 02/15/2018 Winter Program: "Growing Together: Growing Yourself and Your Practice"
09/14/2017 Fall Program: "In Collaboration with ACN: Obtaining, Maintaining and Growing Meaningful Relationships with Clients"
11/17/2016 Fall Program: "Voice of the Client - Effective Collaboration with Consultants"
09/22/2016 Collaboration within ACN: The How, The Why & The Who!